Iran says claim it launched rockets near the USS Harry S. Truman is "psychological warfare". Iran denied on Thursday that its Revolutionary Guards launched rockets near an American aircraft carrier in the Persian Gulf, Reuters reports. 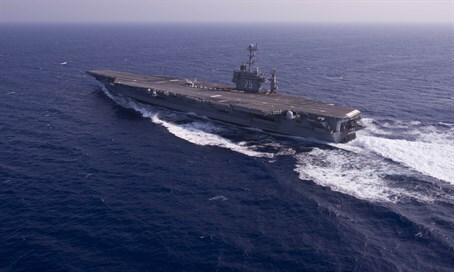 Earlier this week, an American military official said that the Iranian navy test fired several rockets near three Western warships, including the USS Harry S. Truman aircraft carrier, noting that the United States viewed the incident as “highly provocative”. But the Revolutionary Guards’ spokesman, Ramezan Sharif, denied that the incident took place. "The naval forces of the Guards have not had any exercises in the Strait of Hormuz during the past week and the period claimed by the Americans for them to have launched missiles and rockets," said Sharif, according to Reuters. "The publication of such false news under the present circumstances is akin to psychological warfare," he claimed. NBC News, citing unnamed U.S. military officials, said the Guards were conducting a live-fire exercise and that the Harry S. Truman came within about 1,500 yards of a rocket as it entered the Gulf with other warships. Iranian and U.S. forces have clashed in the Gulf in the past, especially during the Iran-Iraq war in the 1980s after the 1979 Islamic revolution.